Mayumi Kawasaki started to participate in track and field in 1996 at Shimodate high school in Ibaragi prefecture, north east of Tokyo. Initially, she was a distance runner, but in 1997 persuaded by Masahiro Suzuki, a new coach of the track team, Kawasaki started race walking. 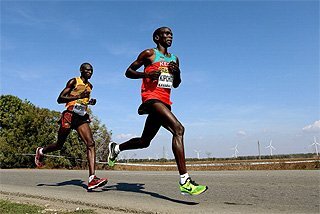 “I figured that the chance of competing at national level competitions is higher in race walking because, compared to running events, the number of athletes in race walking is much smaller. That was my thought when I started race walking,” recalls Kawasaki. Her dream of competing at national level was achieved in a month. She competed at 3000m Walk in the national inter-high school championships and finished 17th. Two months later, Kawasaki was 10th in the national sports festival. In her final year of high school, in 1998, although Kawasaki finished a dismal 33rd in the national inter-high school championships because of anemia, she finished fifth in the national sports festival, and attained her dream of finishing in the top eight at a national level competition. Realising the potential of Kawasaki as a race walker, coach Suzuki introduced Kawasaki to Noboru Ebisawa, CEO of Ebisawa Co. LTD, and recommended her to continue with race walking at Ebisawa sponsored track team after high school graduation. However, Kawasaki always wanted to be a nurse, so her heart wavered between a career in nursing and a career in race walking. At the end Kawasaki realised that “I could go into nursing anytime, but I can only compete in race walking now.” So she decided to continue race walking in Ebisawa Co. track team. In 1999, her first year out of high school, she was second at 10,000m in the Asian Junior Championships. Although Kawasaki suffered from anemia and injuries from time to time, with the mindset of “I want to be the best in the nation,” she made steady progress. Her times and placings in competitions continued to improve. All the hard work began to bear fruit in the 2003 season. She won 20km Walk in Wajima in April with 1:33:45 and followed it up with victories at 5000m Walk at both the All Japan Corporate Team championships in September and the national sports festival in October. To cap the incredible season, Kawasaki set the national record with 1:32:16 in Takahata in November. The following year, at the national championships in January, Kawasaki improved her national record to 1:31:19. Kawasaki became the best female walker in Japan and was thus selected for the Athens Olympic team. 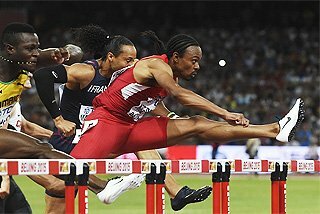 With eyes already set on the Beijing Olympics, Kawasaki resumed training immediately after Athens. She defended her title at the national championships in January 2005 with 1:31:51 and was thus selected to represent Japan at the World Championships in Helsinki. In the Finnish capital, in the race in which Olimpiada Ivanova of Russia won in a World record time of 1:25:41, Kawasaki was in 23rd place at 15km. However, the tough course with hard surface and constant inclines got the better of her in the last 4km and Kawasaki finished 31st in 1:37:30. By 2006, Kawasaki became an international class walker. 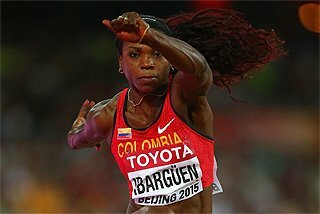 In May, she was 52nd with 1:41:41 in the World Race Walking Cup in La Coruña, and in July she set the national record of 21:24.99 in the 5000m Walk. 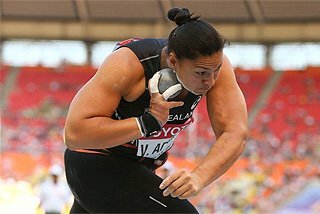 Unfortunately, although Kawasaki was selected to represent Japan at the 2006 Asian Games in Doha, she injured her left knee at the end of July and had to cancel all her competitions in autumn. Then Kawasaki had to wrestle with the difficult decision of whether to compete or withdraw from the Asian Games in December. In the end, she was forced to withdraw from the Games. Even though, Kawasaki always has positive outlook, at the time she was constantly wondering, “When can I start competing?” She resumed her training in mid-December, but due to shortage of training, Kawasaki could only finish fourth in the national championships in the end of January. Not only Kawasaki failed to defend the title she had defended twice, but her national record was shattered by Masumi Fuchise (7th in 2009 World Championships in Berlin) who clocked 1:29:36. 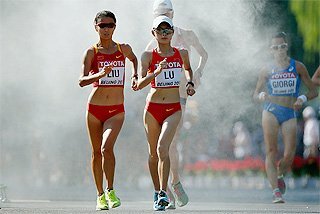 It was also the first sub 1:30 performance by Japanese women at 20km Walk. Coach Suzuki, who has guided Kawasaki since high school days explains: “Kawasaki’s mental strength and leg muscle strength are exceptional.” So Kawasaki started to train soon for the Asian Championships in Neagari which was two months away. In Neagari, Kawasaki won the competition and regained the national record with 1:28:56. In 2007 Kawasaki competed in her third global championships. “I was very calm,” she recalled of her second World Championships experience in Osaka. With the goal of achieving a top eight finish at a global championships, which would be the first by a Japanese woman walker, Kawasaki moved up to ninth by 15km. However, at the end Kawasaki finished tenth with 1:33:35. Although Kawasaki failed to reach her goal of a top eight finish in Osaka, her tenth place finish was the highest ever placing by Japanese women in the Race Walk. Her next goal, obviously, was making the Olympic team. At the national championships in January 2008, Kawasaki went out on 1:27 pace, and left everyone behind. She passed 5km in 21:43, 10km in 43:40 and 15km in 1:06:14, all of them faster than the existing national records. 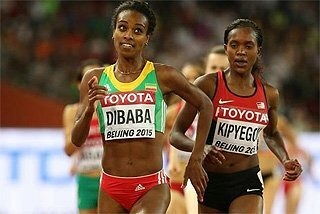 Unfortunately, she slowed in the final 5km and thus failed to improve her personal best, however, she still won the race easily with 1:29:28 which clinched her Olympic berth for the second time. In Beijing, Kawasaki again walked with the goal of a top eight finish. Although, she slowed in the middle part of the race and dropped her position as low as 17th, she came back strongly and finished 14th with a time of 1:29:43. “I could not make the top eight finish, but I am happy to crack the 1:30 barrier in a global championships,” she said after her race. After the 2008 season, Kawasaki made a big decision, and chose to join Fujitsu track team. Fujitsu is a top track team in Japan; among its member are two members of the bronze medal winning 4x100m relay team, Shinji Takahira and Naoki Tsukahara. “In Beijing, I realised how far I am from the world class. In order to aim higher, I understand that I need to test myself in more a competitive environment,” said Kawasaki. Along with Koichiro Morioka, who was 11th in both the 2007 and 2009 World Championships as well as 16th in the 2008 Olympics, Kawasaki started the 2009 season in a new environment under the guidance of Fumio Imamura (7th in 1991, 6th in 1997 World Championships), now a member of the IAAF Race Walking Committee. In her first race as a member of Fujitsu track team, the national championships in January 2009, Kawasaki started the race in a very fast pace. However, she was passed by Masumi Fuchise at 17km and finished second. Although Kawasaki finished in 1:28:49, her personal best and second sub 1:29 clocking, the winner Fuchise regained the national record with 1:28:03. Before the race in Berlin, Kawasaki’s thought was: “I was in great shape. 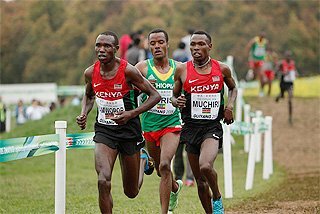 So I reasoned, if I don’t go after the medal today, when would I go after the medal?” Although Kawasaki was racing well in the group behind the top three, around 11km, she was disqualified. For Kawasaki, who had been praised for accuracy of her walking technique by Maurizio Damilano (1987 and 1991 World Champion at 20km Walk), now chairman of the IAAF Race Walking Committee, this was the first disqualification of her walking career. 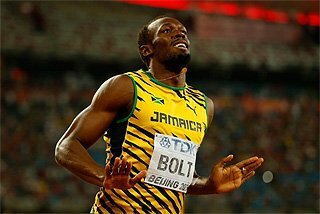 “Although I was disqualified in Berlin, I have no regret for racing aggressively. Actually, I have learned a lot from my mistake,” said Kawasaki. Kawasaki, who lists the World Race Walking Cup as her goal in the first half of 2010 and the Asian Games as her goal in the second half of 2010, trained hard for her targets. 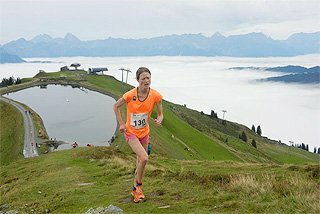 In February she trained for 20 days in Mexico, and on that occasion went over the course to be used in the World Race Walking Cup. One of the results of her hard training was the national record of 42:50 in 10km walk (her intermediate time of 21:27 at 5km was also a national record) at Wajima in April. “My training went very well this past winter. 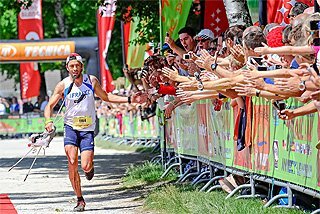 So I am looking forward to competing at the World Race Walking Cup,” said Kawasaki. 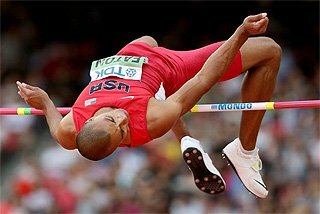 With the experience of two Olympics and three World Championships, Kawasaki realised that what is important in these global championships is not the personal best, but the overall ability. For Kawasaki, who is aiming to be a truly world class walker, the World Race Walking Cup could be the important turning point of her career. Prepared by Ikumi Kodama for the IAAF ‘Focus on Athletes’ project. 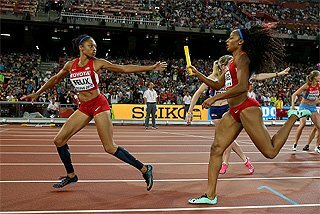 © IAAF 2010.